According to Fox News, the officer—identified as 43-year-old Robert Veverka—hit a patch of ice during the pursuit and rolled several times before coming to an inverted stop on the front lawn of a residence. Image courtesy of Newburgh Heights PD / Facebook. 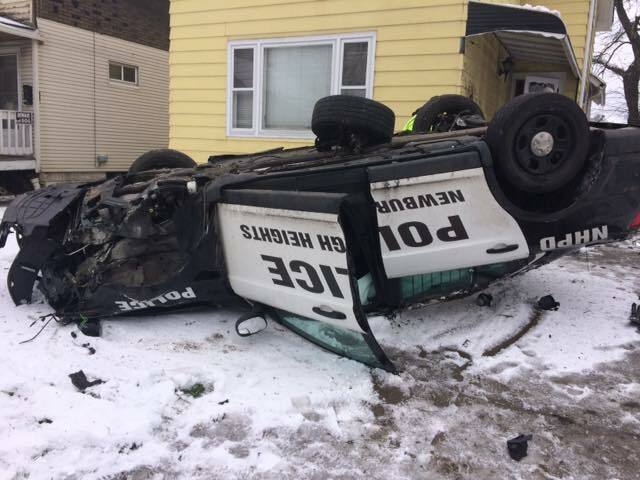 An officer with the Newburgh Heights (OH) Police Department ended up in the hospital after being involved in a rollover crash following a pursuit of a vehicle whose driver refused to stop for a traffic infraction. According to Fox News, the officer—identified as 43-year-old Robert Veverka—hit a patch of ice during the pursuit and rolled several times before coming to an inverted stop on the front lawn of a residence. Several people heard or saw the crash, and helped remove the officer from his cruiser, according to police. The agency posted to Facebook Sunday, "Thank you for the thoughts and prayers for our officer who was injured in a crash today. He is still hospitalized with non-life threatening injuries but expected to make a full recovery." Officer Veverka has now been released from the hospital.